There are several Edward Hopper examples in the collection of The Museum of Fine Arts, Boston , including this beauty, the 1926 House by ‘ Squam River . Can you name its Gloucester location? There are notes indicating that it’s in the general direction heading into Annisquam. IT’S NOT. 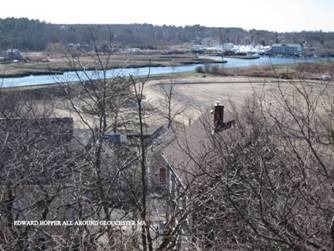 I admit to clinging to this suggested area with some unreasonable hope because of personal bias (my parents lived on Wheeler’s Point for 30 years, and the charm and might of its full panoramic vista). I climbed around friend’s properties, sought views from Pole Hill and multiple high vantage spots. 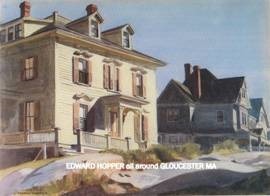 But I could not connect that landscape anywhere to this Hopper image. All it took was reading one tiny email description from a GMG reader – I didn’t even need to visit the spot—to know immediately how right it was. I’m sure some other readers may know it, too. For one thing, many of these Gloucester Hoppers are views seen from a succession of magnificent granite sentinels. 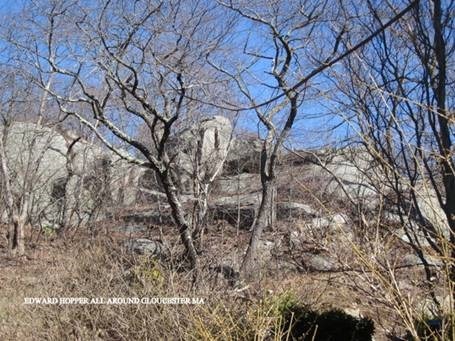 They are sites of great natural beauty conditioned geographically by glacial stone. 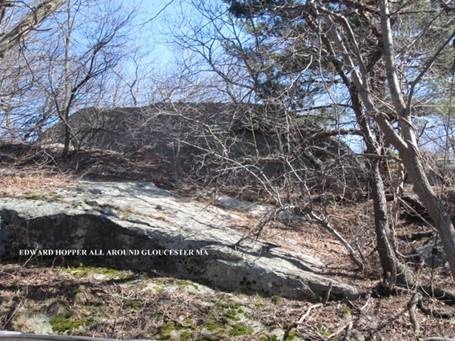 This particular location has a massive sweep of boulder outcroppings. 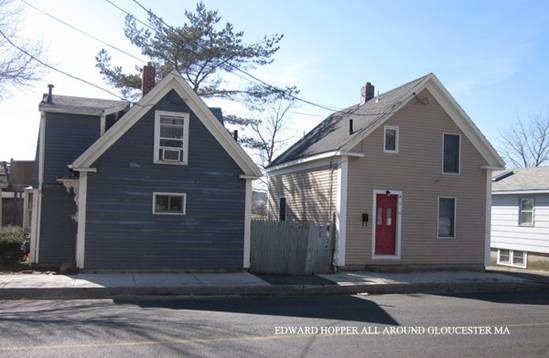 These two houses in the Hopper drawing are still standing and exact. If there is one Hopper, chances are there are others within close proximity. Here’s two other Hopper drawings, all from the same general perch. Who had the keen eyes? 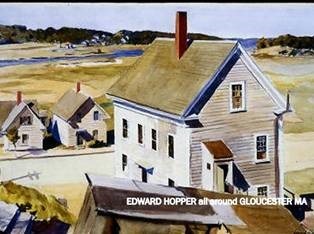 Thank you to Kathy and Jeff Weaver for identifying the sight line for the Gloucester Edward Hopper image, House by ‘ Squam River in the collection of the MFA. It’s no surprise to me that artist Jeff Weaver—who has a history of Gloucester veduta painting himself, and who knows a great thing or two about extraordinary detail, composition, surface and color as bearer of light– would have a tip! You can see more of Jeff’s work here http://www.jeffweaverfineart.com/. Gloucester creates many optimum sites for plein air study, and artists continue to evolve their work into unmissable interpretations of reality. 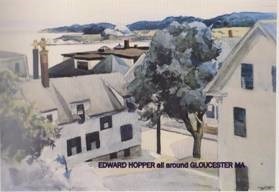 There’s another famous Gloucester artist with a link to this same location, and a nice connection for Gloucester high school, and our students to know. Thanks to Fred Buck for sharing this Strople photo from the collection of the Cape Ann Museum and their archives for the Gloucester HarborWalk’s Virginia Lee Burton marker. 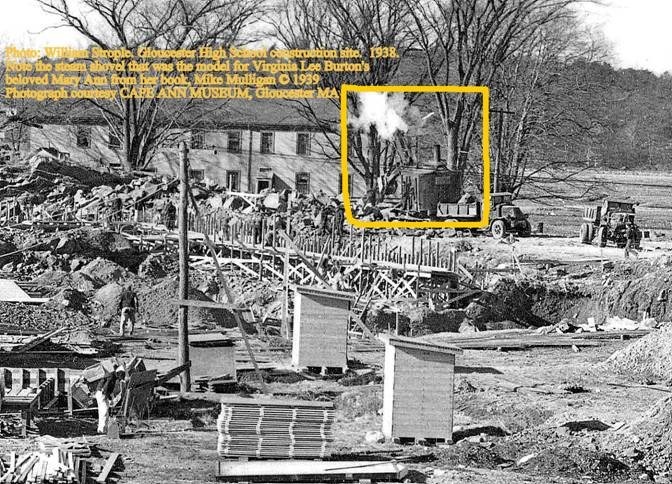 It’s a contemporaneous photograph of the GHS high school being built. 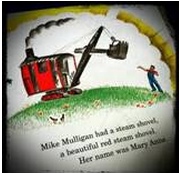 The steam shovel was the model for Virginia Lee Burton’s beloved Mary Ann from Mike Mulligan ©1939. Follow back the plume of smoke- “Mary Ann” is turned away from the viewer.